Firstly, 1-1 was a reasonable result without King, Dawson, Kaboul, Huddlestone, Jenas, and van der Vaart. Birmingham have lost once at home in the league since September 09, which is a remarkable achievement, and testament to Alex McLeish’s ability to set up a team not to lose (that is genuinely not meant to be patronising). However, it’s very disappointing to be ahead for so long, only to be pegged back by a relatively soft goal, and during the game I felt that Redknapp could have reacted more quickly. I personally wouldn’t have selected Defoe as I thought that he looked incredibly rusty against both Arsenal and Liverpool, and yesterday he again showed a lack of sharpness. For me, he should have come off between 55-60 minutes, when he was clearly flagging. 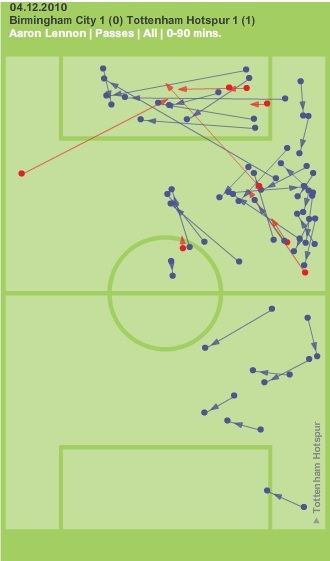 His touch was poor, and the ball often bounced off him, meaning that we were immediately on the back-foot again. Another option would have been to bring on Sandro to shore up the midfield, and offer some protection at the edge of the box. Sandro for Lennon, Modric to a narrow wide right starting position – easy to say in hindsight, I guess. 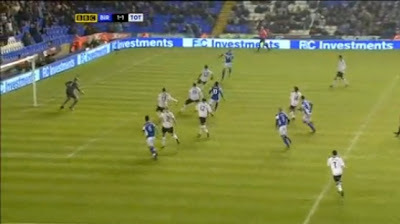 A throw on the Birmingham left is passed back and Spurs look to press out. The ball is worked back out to Roger Johnson, who immediately looks for a long diagonal to Zigic – an obvious target. Zigic has pulled wide, and Assou-Ekotto is nowhere near close enough to him. As a result, Zigic is able to head the ball into the danger area totally unchallenged. Gardner is on the edge of the box, and has anticipated Zigic’s header. 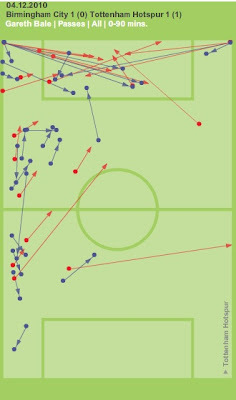 This picture shows Gardner’s run up quite nicely – however, we should have plenty of players in positions to be able to deal with the danger – Gallas and Palacios in particular. Gardner easily gets ahead of Modric, who has nodded off, and it is now a straight battle between Gallas and Gardner. Gardner has the momentum from the run, but Gallas is not brave enough. In my opinion Gardner simply wants to win this challenge more and whilst he shows tremendous tenacity, Gallas should be getting his head on this. A very soft goal to concede – you don’t want to see your main centre back losing out in this manner, but Assou-Ekotto leaving Zigic in so much space certainly didn’t help the situation. 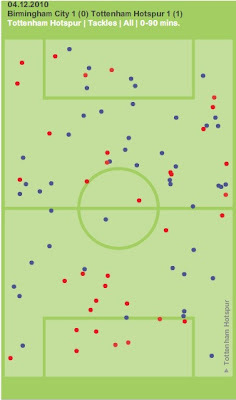 We actually lost a worrying number of aerial challenges in our own box – the red circles at the bottom of this Chalkboard are all aerial battles that we lost – the goal situation being the most central. Having Michael Dawson back will be a huge boost in this respect. Birmingham deserved their goal – they had the momentum with them in the second half, whereas we were mainly restricted to occasional half-chances on the counter. But we simply should have killed them off sooner. Always enjoy your analysis and quite agree that Gallas wasn't aggressive enough, Dawson would have cracked his head to stop Gardner. Even if Benny was closer to the tall fella he wouldn't have stopped the header in. We ended up deeper and deeper and Gomez should have been proactive in encourageing the defence forward.As soon as Gomez got hit in the nuts he seemed completely distracted, love the bloke but he's a bit strange at times. Nice analysis as always. One thing however that only people who were there might've noticed. 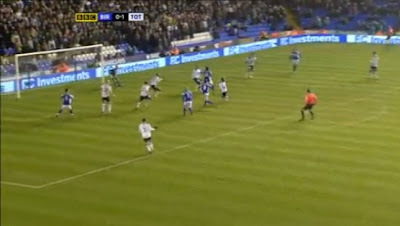 About 5 minutes before their goal redknapp called button over and issued him with some instructions. Button then ran over to ekotto and ushered him to push forward and support bale. This is exactly what he started to do and we were caught out on a few occasions with ekotto then being out of position. The same thing happened with their goal. The reason ekotto was out of position was down to a redknapp instruction for him to push forward. Not saying he would've made any difference given the height advantage zigic has anyway. I was saying as soon as he came on that if he pulled off to the back post one of the central defenders had to follow him and swap with a full back or palacios drop in. IMO it was very poor tactics once again from redknapp. It's easy when we're winning and playing well. He struggles and makes mistakes when we're under the cosh a bit. What annoys me about this and so many other games where we have lost a lead is that, in his after match comments, Redknapp demonstrates that he was quite aware of the problem that eventually lead to us losing a goal. It was obvious that we were dropping off and being too careless with possession in the second half but it seemed to me that Redknapp did nothing about it. Although it was correct to take off Defoe, who I agree is incredibly rusty at the moment, wouldn't it have been better to bolster our midfield, rather than bring on Pav who isn't known for his hard work and pressurising! 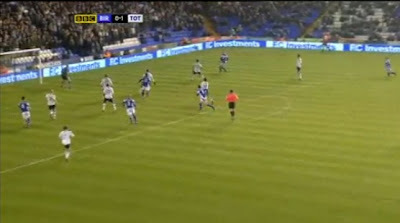 It seems to me that Redknapp hardly ever takes the correct option to close a game out. When you are leading 1-0 with 10 minutes to go, the primary aim should be to stop the other lot scoring. I am getting fairly tired of Redknapp commenting that he thought that we would win or that he didn't ever see our opponents scoring. Such comments only make him look stupid. If he couldn't see it coming, but it happened anyway, what sort of a coach does that make him. While you can't underestimate what Redknapp has achieved, you have to admit that he has a great group of players to work with and with better tactical awareness we could be doing so much better. Unfortunately, this might just be the difference between us actually winning the title or perhaps failing to get top 4 this year. Drwinston001 - very interesting stuff. Zigic called all sorts of problems actually. It's not rocket science to defend well against him, but we made it easy for them. Anon @ 12:00 - Spot on. If he knew Gardner kept gambling, why didn't he bring on Sandro to combat he bursts forward? I was happy to see Pavlyuchenko come on, as I felt we lacked a goal threat and needed to get the vital second, but certainly take your point re: bolstering the midfield. Early goal for us, dominate most of the play, fail to take our chances, concede a late equaliser. In hindsight, Harry should have stuck Dawson on and gone 5 at the back when it became apparent that Zigic was winning everything in the air. Dawson would have knocked him off his stride and the others could then track the second ball and runners. It was apparent on the 60 minute mark that Brum would be a threat. Harry should have made tactical and personnel changes. Sandro should have replaced a tiring and yellow-carded Palacios. Dawson should have come on for Crouch, to shore up the threat from Zigic. Pav for Defoe, to give us fresh legs up front. Exactly the same goal was conceded last season up there. A header knocked across our box, late on. Opportunity missed. But a point I would have taken before the game. I'd be interested to know how many of the aerial challenges we won or lost involed peter crouch. Pav. should have come on for Defoe at least 15 minutes earlier. 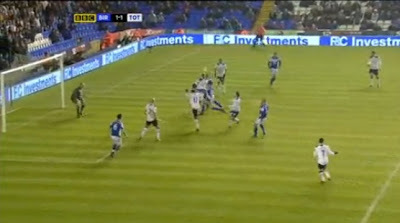 We were 'Out Crouched' here but Zigic can actually head the ball and put it back into the danger area. A lesson for Peter there and the well taken Bassong goal. I think that we were dropping too deep under pressure, a usual Spurs fault. Anon @ 13:25 - some great points. Dawson was another option - good shout. Anon @ 15:44 - Check out the chalkboards here: http://www.guardian.co.uk/football/chalkboards/create. Crouch won 16/22 "tackles" (includes aerial challenges), but lost the only one he attempted in our box. Jimmy - good points as ever. 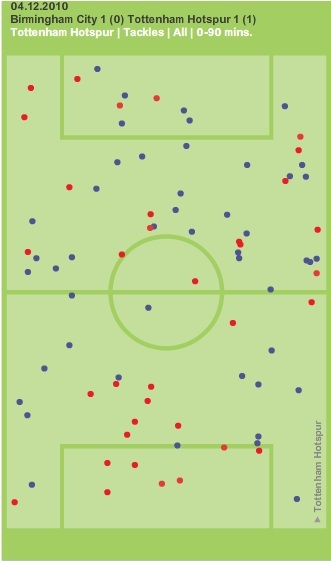 Defending deep is a common problem - I think Gomes needs to encourage them to keep pushing upfield in these situations. What a load of momsense about Harry struggling when we are not winning easily, how many points have we got from losing positions? It's easy when you are winning bacuse you have got it right! Ekotto would not have been told to push forward when defending either, he would have been told to get forward quicker when Bale has the ball so the instructions he received are irrelevent! The point is we didn't take our chances if we had off Zigic and his aerial prowess would not have been an issue. Going 5 at the back would not have helped as we would have just been pinned back. Crouch was left on to defend set pieces. Windy - I looked at the chalk boards as you suggested - If you look at the passes (which includes headers) you will see that crouch was successful with 4 headed passes, and as he won 15 aerial challenges I would say that 11 went astray. Bringing on Dawson to challenge Zigic and going 5 at the back is not an overly defensive tactical formation. We would not have been 'pinned back'. It would just have given us a way to challenge Zigic in open play, negating Brum's main threat. Crouch being on the pitch is all well and good when it comes to marking him at set-pieces, but not in open play. 5 at the back would give us 3 v 2 regards their strikers, and if anything, Brum would then have to be more vigilant apropos Ekotto, Hutton, Bale and Lennon breaking into their half knowing we still had 3/4 defenders back to cover. Agree with your defence of Harry. Crouch's first touch is appalling. I lost track of how many times he gave up the ball to the opposition while trying to bring it down or under control. Even if we just had VDV on the pitch it would've changed the whole thing. And his missed layoff to Lennon was the game winner right there but he didn't even see him! Instead he tries to squeeze it through to Defoe between two defenders. Definitely need a top class striker come January. Help us Daniel Levy you're our only hope.